DiverseArts is excited to announce its 13 year of producing Fresh Black Paint, an opportunity for audiences of all backgrounds to experience the voice of contemporary African-American visual art. 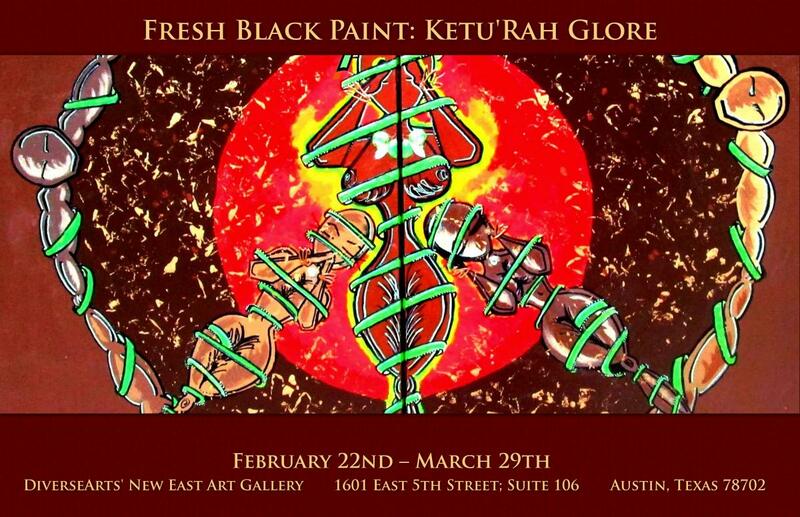 This year DiverseArts is proud to present the abstract works of Ketu’rah Glore. Fresh Black Paint has been a long standing tradition to showcase the importance of observing the significance of African-American Heritage not only during the month of February, but year-round as well. This eye-opening artist reception is being held on Saturday, February 22 from 7-10pm. DiverseArts has the tradition of working with up-and-coming as well as established artists capable of invoking thought and reflection through their intriguing works. Ketu’rah’s ability to work with mixed media and her abstract approach to ethnic art made her the ideal artist to work with. We’ve been lucky to have the pleasure of collaborating with exceptional artists in the past, and we at DiverseArts are happy to add Ketu’rah to the list. Join us during the opening of her exhibition, and throughout its run as well. With an Abstract Eye, the artist sees the world as it would be if things were as they could be. Ketu’rah Glore has such an eye. Ketu’rah’s roots stretch from Africa to San Diego, to Atlanta, to New York, and thru parts of Europe. She began transferring thoughts to canvas around the age of 14 when she realized that she had a knack for expressing herself thru art. The young artiste found guidance and inspiration in the tutelage of renowned artists Maurice Evans and Grace Kisa. Along her journey thru Life, releasing her stresses thru art became therapeutic for her. "Pressure may bust pipes", but Ketu’rah creates precious jewels out of the weight of the world. Ketu’rah describes her style as “ethnic abstract” while remaining “universally beautiful mixed media”. She is an artist who turns concepts of unique perspective into a smorgasbord of food for thought for those who would feast their minds eye upon her creations. Her works are provocative enough to invoke opinions, yet brilliant in the simplicity of the message that they represent. In addition to being a prolific painter, Ketu’rah is an acclaimed artist. She earned a Degree in: Computer Aided Draft & Design from ITT Technical Institute March 2011 in addition was inducted into the National Technical Honors Society on August 21, 2010. At the Killeen Spring Art Competition in 2008, she was awarded The Golden Toad Award for her painting titled “1977” and she was also voted “The People’s Choice” at the same competition. Ketu’rah was appointed the biographical candidate to represent Killeen, Texas in the prestigious Cambridge “Who’s Who among Executive and Professional Women” (2006 – 2007). DiverseArts is dedicated to helping promote and expand cultural awareness and appreciation of the arts here in Austin and has been doing exactly that since 1994. Support cultural diversity, support the arts, DiverseArts! .....a great nation deserves great art. Also sponosred by the, Austin Revitalization Authority (ARA), a private, non-profit community/economic development corporation working in the East 11th and 12th Street Commercial Corridors to restore the cultural and economic viability that once thrived in this area. ARA’s mission is to engage in commercial, residential and cultural development that promotes community well-being, while respecting the people, institutions and history of East Austin and other underserved communities.